Exeter City's David Wheeler says his side's second-half comeback against Shrewsbury on Saturday showed the character within the squad. The Grecians were 2-0 down at half-time but substitute Wheeler's header sandwiched Tom Nichols' brace to give City a 3-2 win at St James Park. Exeter's victory ended Shrewsbury's run of six successive league wins. 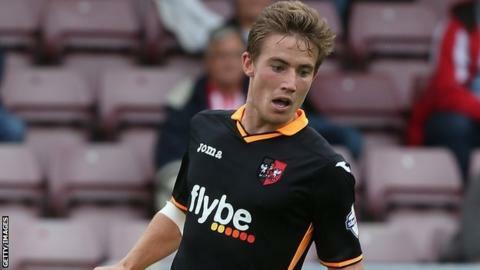 "We dominated the second half and that showed the character of the lads," Wheeler told BBC Radio Devon. "The first half was pretty grim viewing from the bench and I'm sure for the fans too because we were 2-0 down and it could have been three or four. "We went in at half-time hanging on a little bit and then in the second half within the first minute Tom scores and from then on attacked all that half." Wheeler, 24, was pleased with his equalising goal, after coming off the bench 12 minutes earlier. "That's one of my biggest parts of my game, my aerial ability, but I definitely want to be scoring a lot more headed goals, so I am really chuffed with my second this season." The winger hopes the win will be a springboard for Exeter to build on for the rest of the season, with Paul Tisdale's side currently three points outside the League Two play-off places in ninth. "I hope so, I don't think we can assume that will be the case. "We have a lot of control in games, we are very good at keeping the ball and we have good possession in most games. "I think we are better at that this year than last year."